TRIVIA of Noh : Q47 : What kinds of props are used for Noh plays? | Home | Trivia | Q47 : What kinds of props are used for Noh plays? What kinds of props are used for Noh plays? Unlike Kabuki, Noh plays are performed on a simple stage without backdrops or scenery. Some minimum items required for representation appear on stage, however. Small items used on stage are normally called "stage properties." 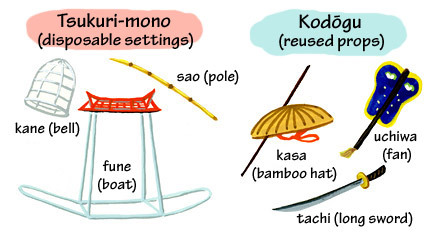 In the Noh world, these are classified into two groups: kodōgu (reused props) and tsukuri-mono (disposable settings). Kodōgu (reused props) are prepared items that are kept and used as needed such as masks and costumes. They include fans, round feather fans, swords, sickles, religious items, and musical instruments. Most reused props are used for the depiction of characters. They are often categorised into two groups: obidōgu (those worn by performers) and mochidōgu (those held in hands). Tsukuri-mono (disposable settings) are items that are made for each performance, and discarded afterward. Once there were specialists in making properties called tsukurimono-shi (prop makers), but actors now make their own properties. Larger disposable settings include the shrine archway for "Nonomiya", the carriage for "Yuya" and the big bell for "Dōjōji". Smaller ones include walking sticks and rods made of bamboo poles. Bundles of firewood in panniers are also included in this group.